The Años Luz shadow puppetry performance offered a great artistic production suitable for all family members. 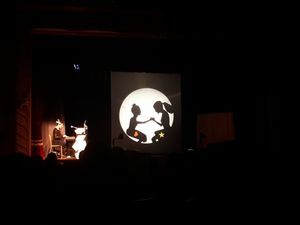 The Spanish performers harmoniously combined the shadow puppetry with various musical pieces that managed to captivate the attention of the whole audience especially that of young children. The co-ordination between the puppetry and the soundeffects of the performers was impressive. The transition between one scene and the next was smooth and the creative use of different media to set the background was highly original. The show kept the audience guessing and also left room for imagination and interpretation for both children and adults alike. Apart from being visually pleasing, the puppetry show provided a take-home message of friendship and perseverance. The audience was engrossed in the performance offered by the experienced and talented cast.